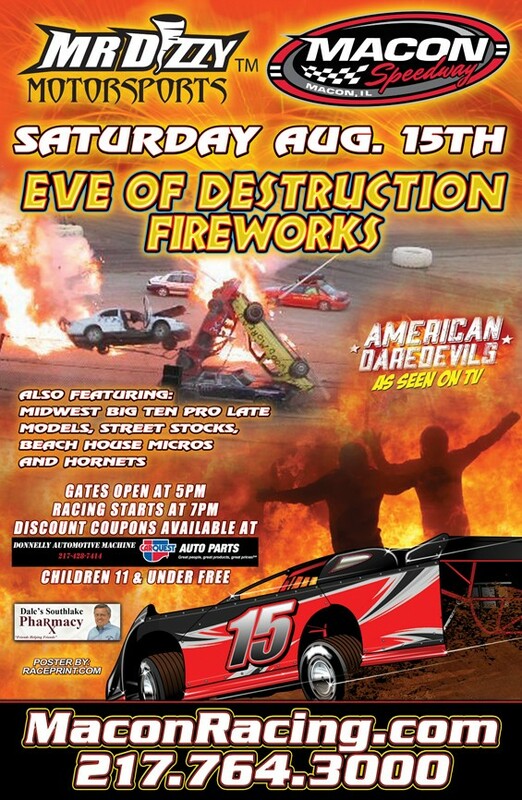 Macon Speedway will be entertainment central for family fun this coming Saturday, August 15, as the first ever Eve of Destruction is held at the facility. Final preparations are being put into place for car explosions, a steel wall crash, fireworks, racing and more. Discount coupons for the event are located throughout the area including Donnelly’s CARQUEST and Dale’s Southlake Pharmacy. Fans, both young and young at heart, will be treated to world renowned, Mr. Dizzy, who has appeared on the History Channel TV show, American Daredevils. Mr. Dizzy is a five time world record holder for different stunts that he has been able to accomplish. Mr. Dizzy will escape an exploding vehicle and be part of a steel wall crash. In addition to those two events, fireworks will close out the show that includes racing action in four of Macon Speedway’s divisions. Competing during the night will be the Midwest Big Ten Pro Late Models in the Shrine 50, UMP Street Stocks, Beach House Micros, and UMP Hornets. Mr. Dizzy and his wild and crazy buddies will be on hand at Shaner’s Auto Salvage in Springfield on Friday to perform a death-defying firewalk. 92.7 WQLZ will be on hand, providing a live radio remote of this dangerous stunt to kick off the weekend. Pit gates open Saturday at 4:00, grandstands at 5:00, registration closes at 6:00 when hotlaps begin, and racing will take the green at 7:00. Adult admission is $15, while children 11 and under are free. Discount coupons are available at numerous businesses in the area including Donnelly’s CARQUEST and Dale’s Southlake Pharmacy. Macon Speedway is located nine miles south of Decatur on U.S. 51, then 0.6 miles west on Andrews Street and south to 205 N. Wiles. Macon Speedway hosts racing every Saturday night, plus many weeknight specials.